I never played the original Super Smash Bros. I vaguely remember watching my brother play with a friend who had an N64, but I don’t remember playing myself. My first introduction to the game was through the Game Cube sequel Super Smash Bros. Melee, which I naturally played with my brother and then eventually with other people. It was definitely one of my first games, though, and as such, I actually had very little idea who any of the players were. Sure I knew Link and Zelda, who doesn’t? And Mario, Luigi, Peach and Yoshi were pretty obvious. Then, of course, there was Pikachu and Mewtwo, because I did watch the show on occasion. Everyone else, though, I had no idea. So I floundered around with a few different characters in my unskilled attempt to keep up with my brother and settled, eventually, on the cool warrior looking guy with bright red hair. Once I started playing as Roy, there was no going back. I realize, of course, that the reason I like Roy so much is that he’s pretty over powered. He doesn’t have any range, sure, but his power attacks are killer. If he has time to power up his smash attack you stay away from him at all cost. Most of his attacks involve fire coming out around the blade. I don’t know what that says about him, but it looks super cool. This was the kind of character I needed as a beginning gamer who had no concept of to use the shield button. This was the character that would help me hold my own in battles against my much more talented brother and his friends and in long combat changes and challenge modes. While my brother switched up his characters, playing with different people each round, I was Roy each and every time. Forever Roy. Then we grew up, and I tried playing with other characters. I wasn’t great with anyone else, not like I was with Roy, but I did alright with Zelda as Sheik mostly and Ganondorf wasn’t so bad. I liked the idea of Pikachu, but never did super well with him. Regardless of who I tried, I always went back to Roy. Until we moved on to Super Smash Bros. Brawl and they took him away. I was so sad when I learned he wasn’t going to be in it at all. Granted, that wasn’t until after the game was pretty much out and I was playing it with a friend, but still, it was rather depressing news. How could they replace my Roy with Ike? I had to learn to play as other characters for real. I had to find a new favorite to be my norm. Samus was okay, but she wasn’t the same. I played with Sonic a bit, which was better, but not quite as cool. I became a wanderer, going from fighter to fighter for each new match. Rarely playing the same character twice. This carried over into the newest Smash Bros. installment for the WiiU. My husband got it for me for Christmas; the WiiU, that is. We had to wait a little while for Super Smash Bros. Once again, there was no Roy. Sometimes Marth would do, I tried Ike out or the other Fire Emblem characters they’d thrown in, but they just weren’t Roy. I had gotten over it by this time. They weren’t going to bring back my favorite character. They had replaced him and I would only get to play him on the Game Cube at my parents house sometimes. I had accepted this fact and moved on with my life. And then they brought him back! Several people sent me the video when it appeared and articles announcing the return of Roy as a DLC character. I may have squealed a little bit when I watched the promo for him, not going to lie. My husband, being the wonderful man that he is, kept an eye on it to see when he would be available and as soon as he was we were on that. We played for an hour at least and I never changed from Roy once. It felt so good to play as him again, to watch his flowing cape billow as he smash attacked the crap out of all his opponents. And the cherry on top? He has like three different purple outfits for me to choose from. I never thought that I would have too many purple options, but I do! This is the best problem ever! I may never play as anyone else again. 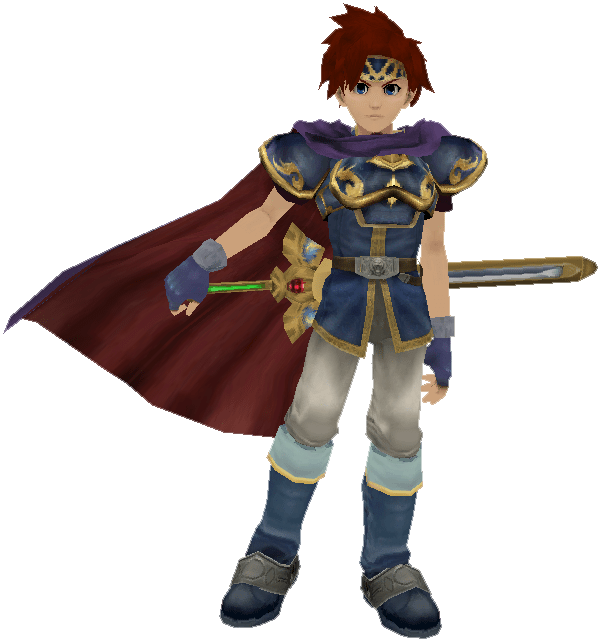 Roy will always be my favorite character, even if I’ve never played the game he’s from. I will always be forever Roy.